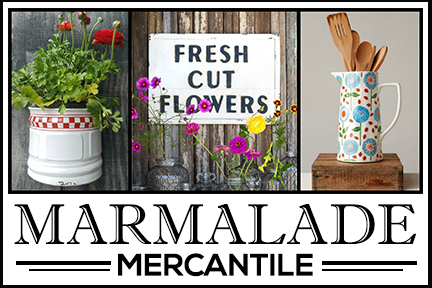 I love, love, love vintage bottles and have collections of aqua, brown, and lavender. 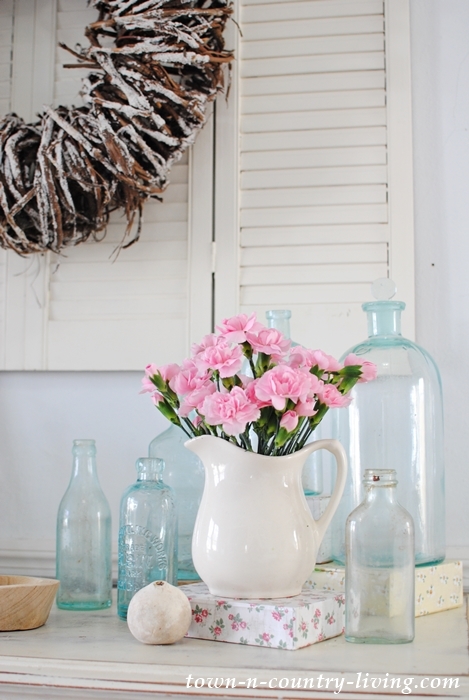 I grouped some of my aqua bottles around another favorite – a white ironstone pitcher filled with pink carnations. 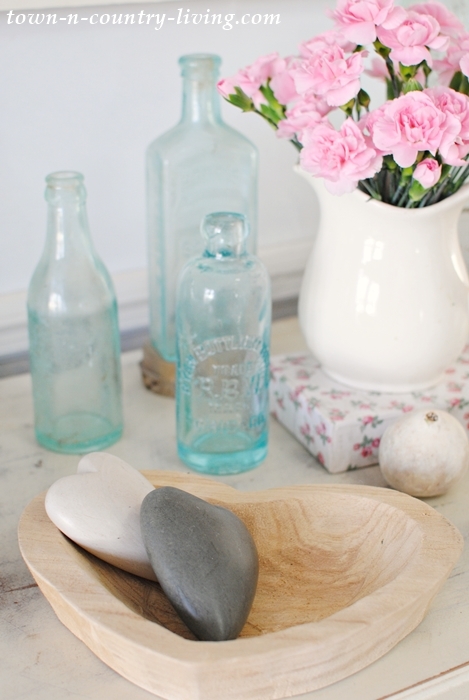 To add a little earthiness to my spring vignette, I included my favorite wooden bowl, shaped like a heart. 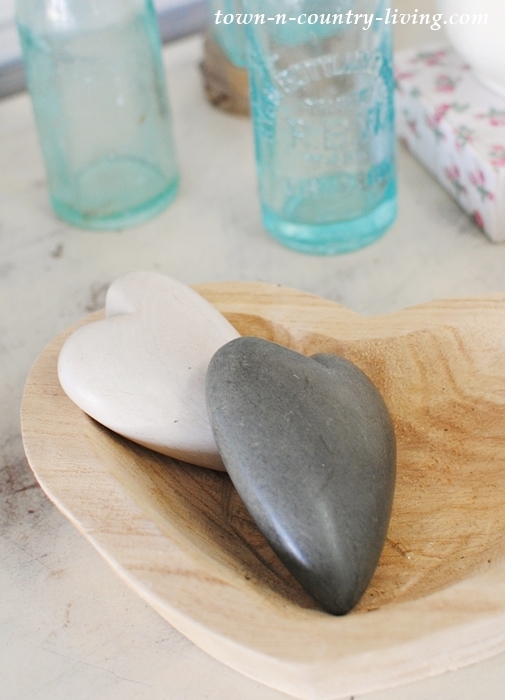 The smaller hearts are carved from stone and are so smooth and cool to the touch. I purchased them for Valentine’s Day but am keeping them out a while longer because I like that so much. Who says hearts are only for Cupid’s special day, anyway? On the other end of the dining buffet is my favorite, chippy wooden candlestick. 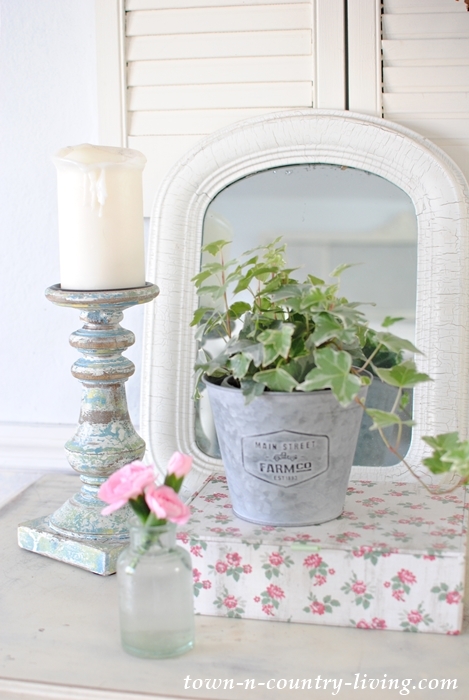 If you’re a regular reader, you know I love vintage mirrors. I had to include a small white one. 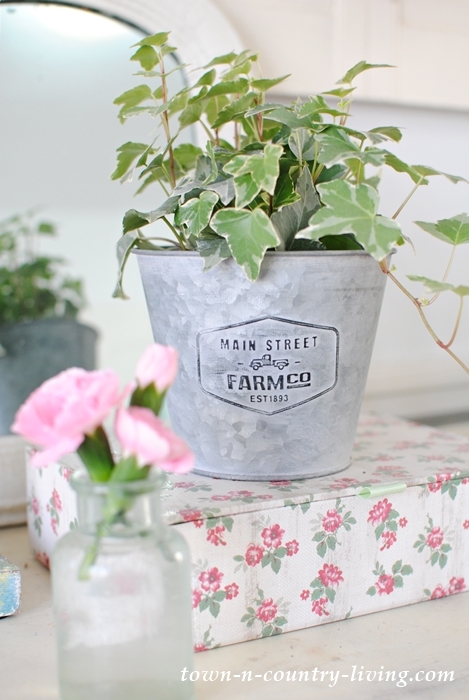 A pretty little ivy joins the spring vignette in a metal farmhouse flowerpot. Our local greenhouse sells these for just a few dollars each. 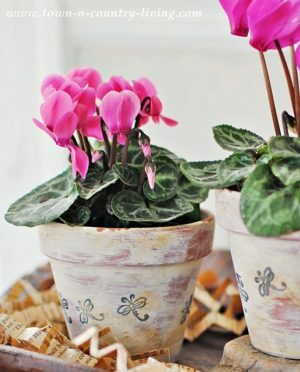 To give it height, it sits atop a pretty flower box. 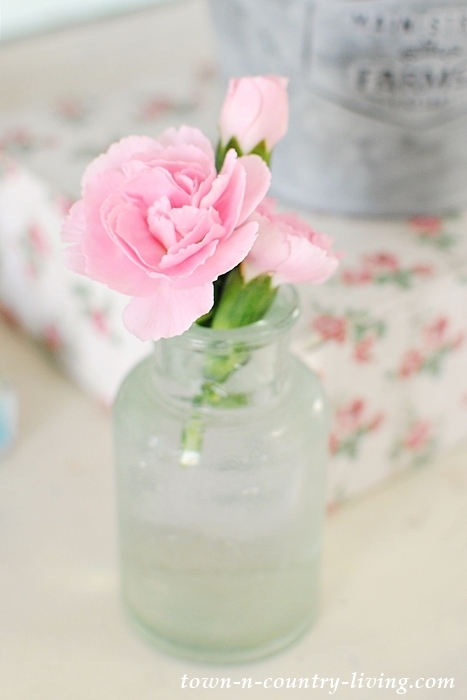 A tiny vintage aqua bottle holds a few carnation buds. I like the small carnations best. I kept the painted shutters on this wall since the color matches the dining buffet. 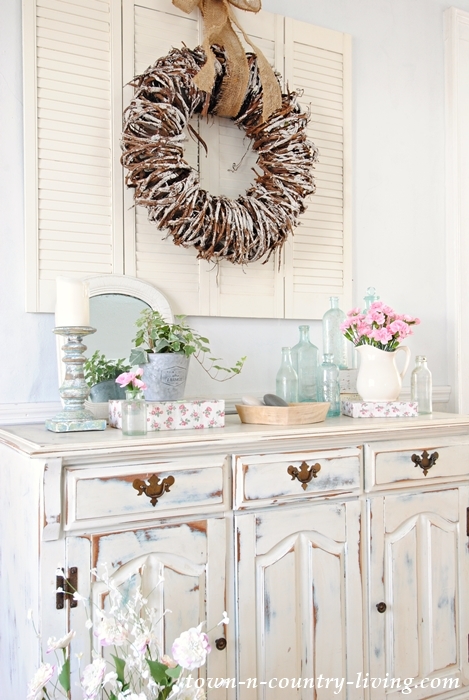 I hung a rustic bark and twig wreath to keep the spring vignette from looking too sweet. Plus I love the texture of the wreath. What favorite things do you like to include when you create a spring vignette? 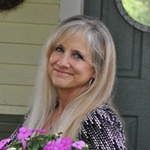 I love your vignettes Jennifer. So Pretty! This space turned out so well. I really love the wreath hanging above shutters. It is the perfect home decor for spring, bringing the outdoors in! 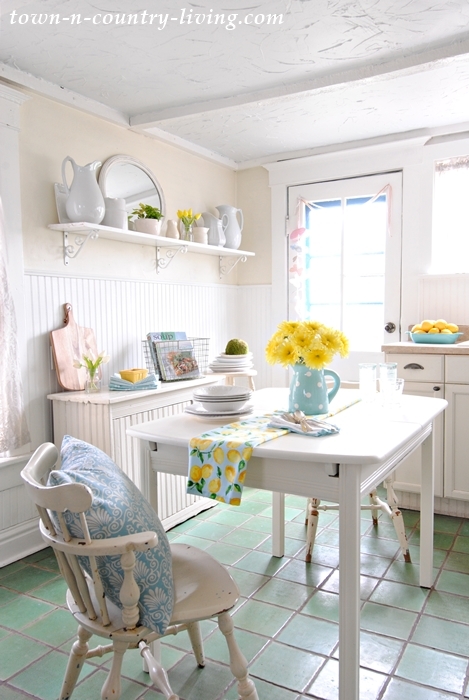 The whole vignette looks so very fresh and you are ready for spring. I love the heart shaped bowl and the galvanized bucket. I am late to the game for spring decorating but you have inspired me. Most of my house right now is in some stage of being updated, but I do have 2 bedrooms and 2 bathrooms that are nearly complete. 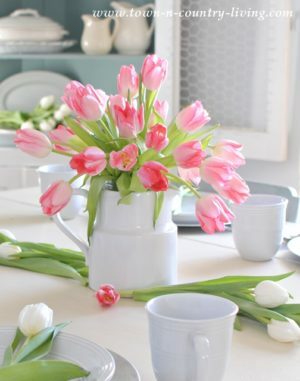 For me, Spring means sheer curtains at the windows replacing anything heavier, new light and bright shower curtains, rugs and towels in the bathrooms and new lampshades on the bedroom lamps. When more is updated, the bookshelves will be re-styled to less is more (and seriously dusted while I’m at it) and also a white slipcover on a favorite chair as well as more seasonal pillow covers. My front door wreath has been changed to Spring and while I’m not at the point where I am pondering vignettes, it already feels fresher and ready for Spring. I love old bottles too, i like the way you add then to the vignette. 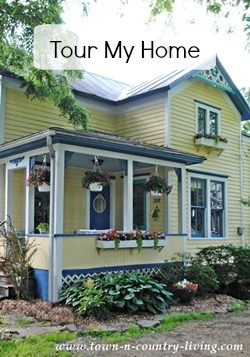 I just really like your home. 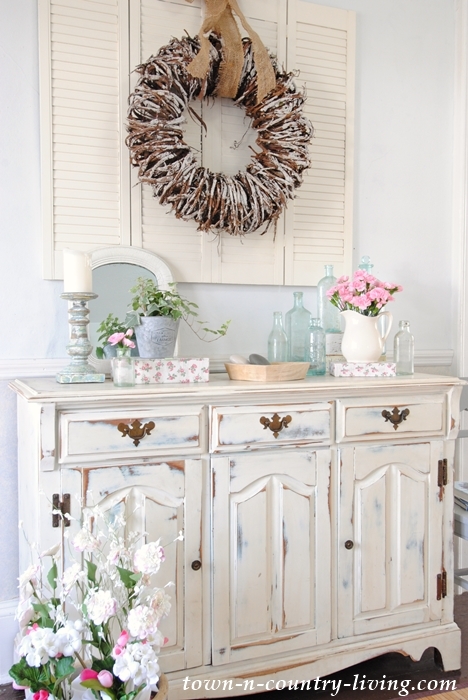 Everything is so beautifully put together I especially love the wreath …. 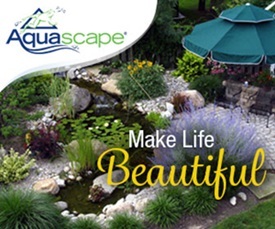 Happy Spring..